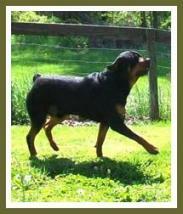 Are you thinking about Rottweiler rescue? Or, have you already fallen in love with a homeless Rottie, and now wondering what you’ve gotten yourself into? 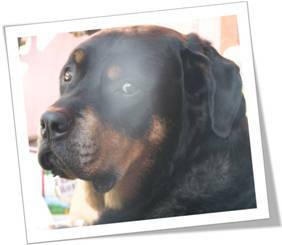 My husband and I rescued a 15 month old male Rottweiler in 2003 (pictured below) – You can read his story as well as others at my Rottweiler Adoption page. This page contains questions, answers and every bit of information I could think of to help you, based on our own personal experience with a rescued Rottie. Note ---> if you have a specific question, or are searching for something in particular and you don’t find it here, please feel free to contact me, and I will help in any way I can. Rottweiler Rescue - How does a Rottie end up there? Usually through no fault of their own, dogs are abandoned or not kept properly, and end up on the streets (and in the cross-hairs of the animal control officer), or confiscated from degenerate owners, or puppy mills. Rotties are especially susceptible to abandonment or relinquishment because of people who think they want this breed of dog, due to trends or perhaps a misguided yearning for a big mean guard dog. But, they never take the time or responsibility to research if a Rottie is really the right dog for them. These people soon find themselves overwhelmed by a dog that can out-weigh some family members, and then they just want to "give it back" or "get rid of it." You are obviously not one of those people, or you wouldn’t be here researching. I, and ever Rottie in the world thank you for that. 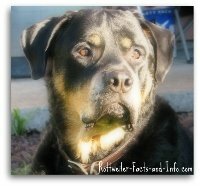 Of course, the above is not the only reason a Rottie, or any other dog can become homeless. Things happen – the dog’s owner may have passed away, or housing circumstances may have changed. Sometimes there is a lot of information about how a dog ended up in a rescue facility, and how she’s been raised and trained. And sometimes you have no idea what happened to land them there, or what happened to the poor soul in his past life. You can only guess and try to piece thing together based on his behavior in different circumstances, which is what we had to do with Chevy. Will you take 1 minute to answer 3 questions? Chevy’s story will give you a lot of insight into what might have happened to your dog, and how to work through some of the issues together. It will also help you know that there is light at the end of the tunnel and with time, work and love your Rottie will start to forget his past life and begin to love and appreciate you more than you can imagine. Ok, enough of the tears already. 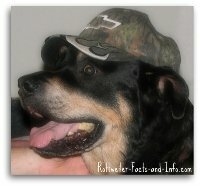 . . . .
Rottweiler Rescue - What does it mean to rescue a Rottweiler? There are thousands of animal shelters and pounds around the world where a Rottweiler might end up. There are also 100’s of Rottweiler Rescue Groups, and they are the best place to get free Rottweiler puppies if that's what you're looking for. Although dogs are usually received as teenagers and full grown. These groups are usually run by volunteers and networks of volunteers who are passionate about the plight of these dogs, and they focus specifically on the Rottweiler dog breed. You can learn more about individual groups, and even find one in your area by clicking the link above. To rescue a Rottweiler in today’s meaning of the term, would be for you to contact one of these specific groups, and see their available Rottweiler rescues. Your experience, time available, housing situation, etc. would be matched up with a rescue dog or puppy that has the same needs you’re able to meet. You will also likely have to go through a screening process, just as each of the rescue dogs themselves do. After a Rottie ends up in a rescue, the last thing they need is to end up back there again, or worse – adopted by someone who abuses or neglects them. While Rottweiler rescue can be some of the hardest work you’ve ever put in, it is also the most rewarding. Side note: I tend to be a very impatient person, so my husband was pretty worried when we rescued Chevy. However, working with him and knowing (or at least guessing) what he’d been through, really helped me get a handle on myself – bonus! 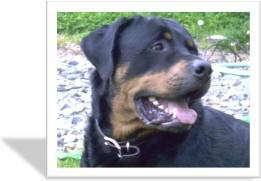 Rottweiler Rescue – Is there criteria that I have to meet? How about the dog? Please keep in mind this is not an exhaustive list, each rescue group will have their own set of criteria. But, this will give you an idea of what to expect if you choose to rescue a Rottie. Fearful of certain things, etc. All of the information gathered for both you and the dog are meant to make sure that the perfect match is made – the dog’s needs and issues (if any) vs. your family and housing situation to ensure the best match is made. 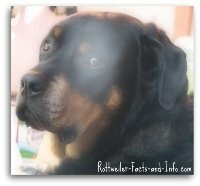 Rottweiler Rescue – What costs are involved with dog rescue? Not quite ready to commit? If you’re not quite sure that a Rottweiler is for you, or if you’re just not ready to commit to an official dog adoption, there is some middle ground. I could actually go on and on, but if you’re not sure that Rottweiler Rescue is for you, then I really encourage you to look into fostering. 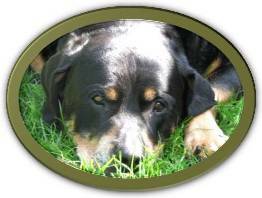 Almost all Rottweiler Rescue Groups have information about becoming a foster parent, and would be glad to talk with you and help you learn about what all is involved.